The Gothic District is the heart of the Old town of Barcelona, and is considered one of the most beautiful areas of this city. A maze where you will find monuments, buildings, squares and incredible hideouts full of history and life. 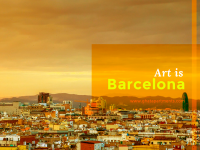 By Julia Moreno / Translated by Karim Hatim | It is the center of the city, also known as the Old Town, but this does not mean you go to find modern buildings that mark the contrast with medieval ones. 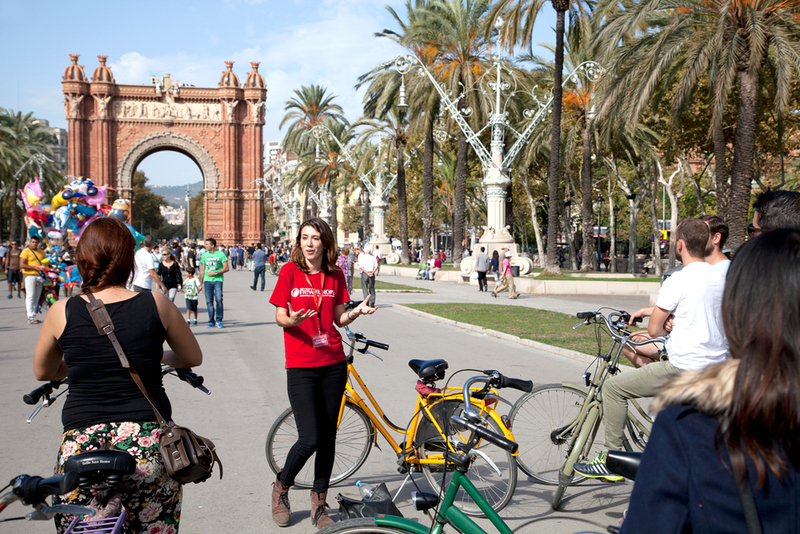 To locate better, since it is easy to miss, we tell you that is delimited geographically by Plaza Cataluña, Las Ramblas, Via Laietana and Paseo Colon. 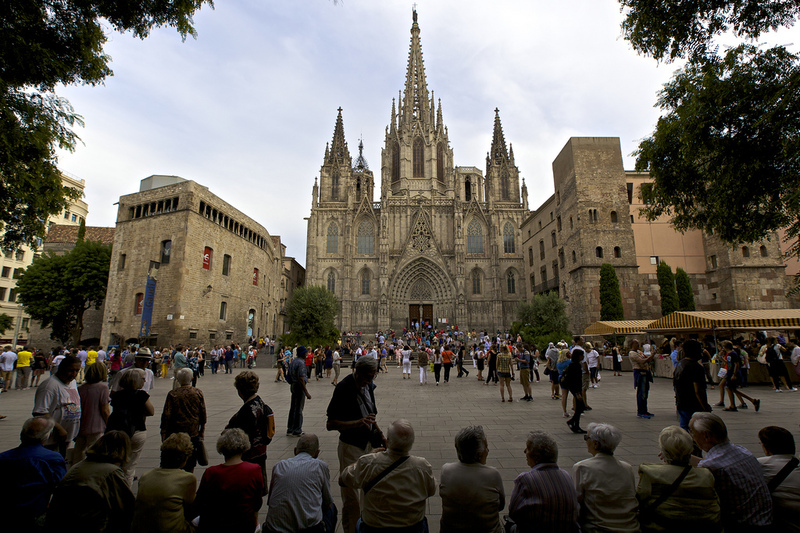 The Gothic neighborhood is a place where you have to walk it or do when you come to Barcelona. 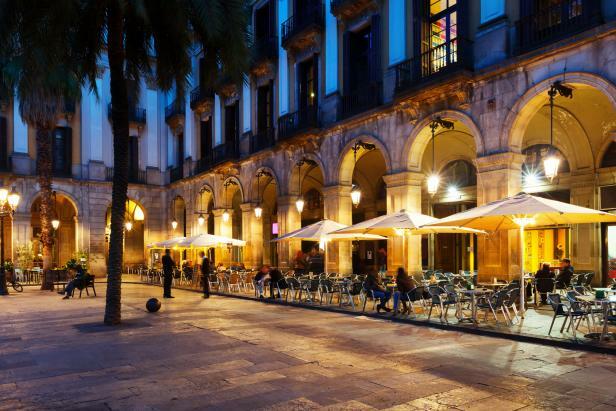 Besides being an area full of treasures, also it offers a wide range of restaurants serving traditional Catalan cuisine and exotic dishes; or bars that will prepare incredible tapas that can accompany a nice cold beer or a glass of wine. In the following article you will know firstly architectural gems and then locals to end fill the stomach. 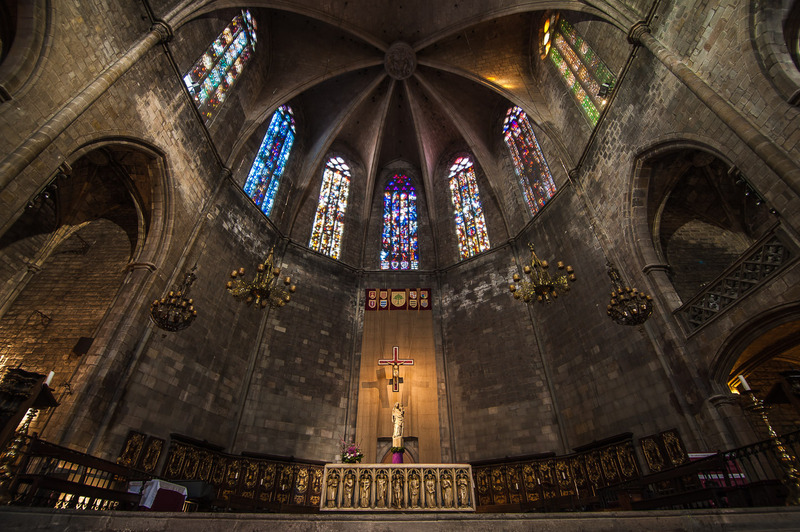 Cathedral of Santa Eulalia: It was built in honor of the patron saint of Barcelona, ​​which at that time was Santa Eulalia. Later this had to share the title and honor of the Virgin of Mercy, the second patron of the city. The origins of the cathedral date back to a three-nave basilica destroyed in 925 by al-Mansur. It was rebuilt, on the same, a new temple with Romanesque style around the year 1046, demolished years later, and which retain very few elements. Already in XIII century it stands what is the present cathedral, completed in the nineteenth century, when the last part was: a neo-Gothic façade of 70 meters, which is present in all the pictures of all the tourists passing through Barcelona. The most notable parts of this beautiful cathedral is the dome, with the statue of St. Helena, Eduard Alemton work; the two lateral towers that basically differentiated by the bells hanging from them; gargoyles, graves and shields of guilds and brotherhoods who participated in the construction and the five gates through which we have access: the main door, Ivo portal, door of Santa Eulalia, Santa Lucia door and door of Mercy. Plaza de Sant Felip Neri: A beautiful square whose key source and beside a Baroque church with the same name: San Felip Neri. Its facade keeps traces of bombing of the Civil War. Also in this square you’ll find the Museum of Calçat (Footwear Museum), home of the guild of shoemakers, in 1943 moved stone by stone from the Cathedral, which was its original location until this square. Attached to it, you will find the guild of coppersmiths, which was based in Via Laietana from the sixteenth to the nineteenth century, when it moved to the Plaza Sant Felip Neri. 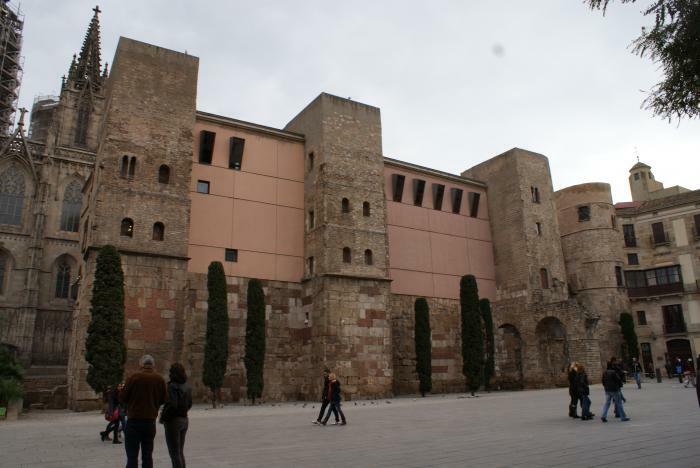 Casa de l’Ardíaca: This building was built in the twelfth century by the Cathedral of Santa Eulalia. Within its walls many stories lived, went through his ecclesiastical stage time of the archdeacons, the yard in 1870 was used as a cloister, and years later after being auctioned became the College Association of lawyers of Barcelona, at which time it was remodeled and acquired a modernist style. Finally, in 1920 it became the property of the municipality, which used it as a historical archive. 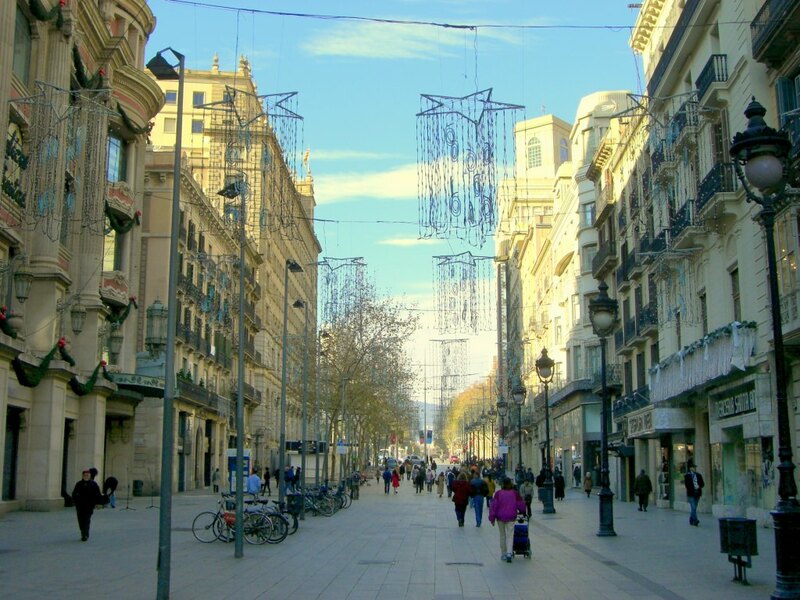 Plaza Sant Jaume: A small square but incredibly important, because it is located in the heart of the city since medieval times and was the center of policy development and administrative activities of the city: the forum. In this square the temple of Emperor Augustus rose, of which only four Roman columns, located on the street Paradis are kept current. At that time, this place was established as a military settlement, and in it the two main streets of the town compose intersection: the “Cardo” and the “Decumanus”. Since then -and even today there are celebrated the most important events of public life- . And where we are now building the Palau de la Generalitat de Cataluña (Catalan government headquarters) and the Casa de la Ciutat or Ayuntamiento of Barcelona (Town Hall), ​​facing each other. 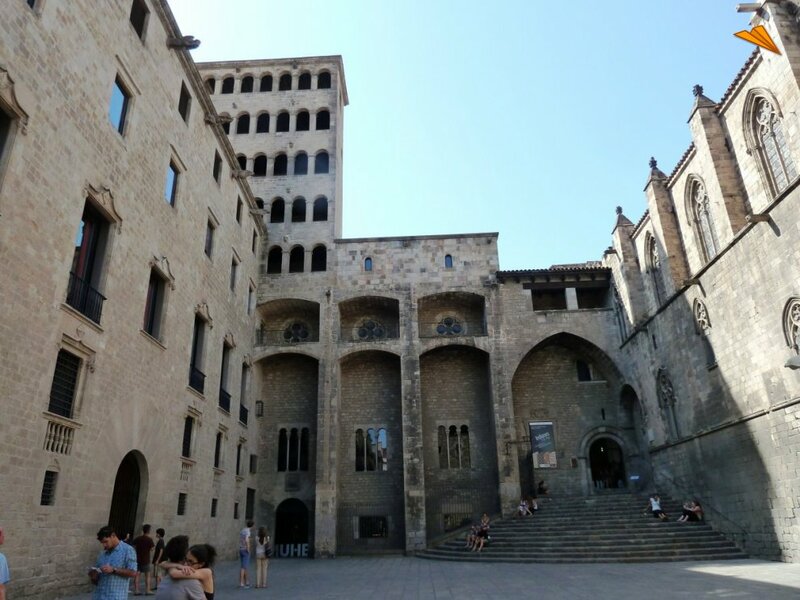 Plaza Sant Just: Located in a quiet place Romanesque, austere style with an inexplicable charm. 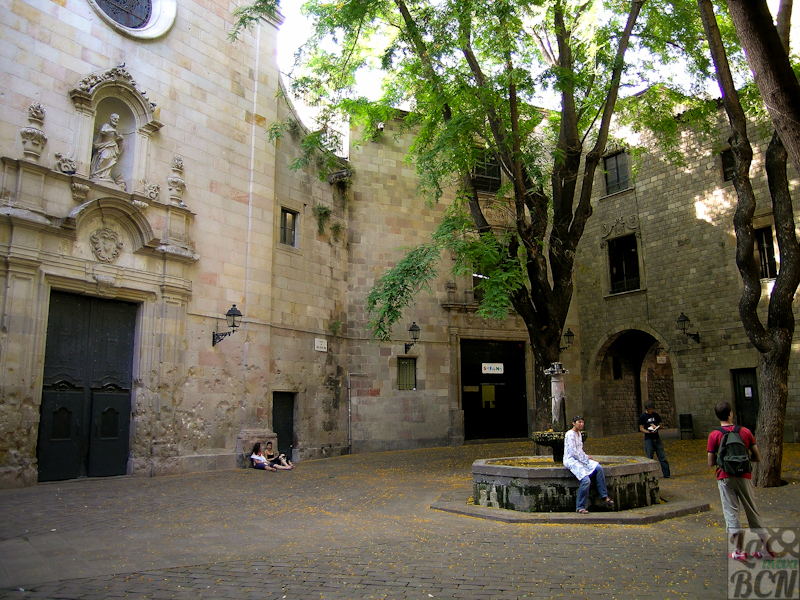 It is the oldest public source of the city of Barcelona. It was built by order of the noble Joan Fiveller in one of his hunts, after finding a natural source in Collserola. The Source is attached to the house Fiveller family, which also gave the parish cemetery (now Plaça de Sant Just) of the church of Saints Just i Pastor. It stands out for its unique pipes, three stone heads of those who do not really know its history, then also draws attention to a hawk carved into one of the side walls, as representing his hobby of hunting. – Basilica Sant Just i Pastor: It was built in the fourteenth century. Its exterior is striking not like other churches, its architectural simplicity is what gives it that own charm. If you go there, you will host between high walls and massive columns; a haven of peace and tranquility. This church was built as a temple Romanesque – time when they were dedicated to the Saints Just and Pastor – until the fifteenth century, when it was restored and turned into a Gothic temple except the facade which still neogothic. Ancien Quartier Juif : Many know him by the name of Call, as they call it in Catalan to the Jewish quarters. This is the area surrounding the cathedral and was one of the largest and most important Jewish neighborhoods of the time, today still famous, but it is one of the busiest places of the Gothic, as it is difficult to know their geographical limits. 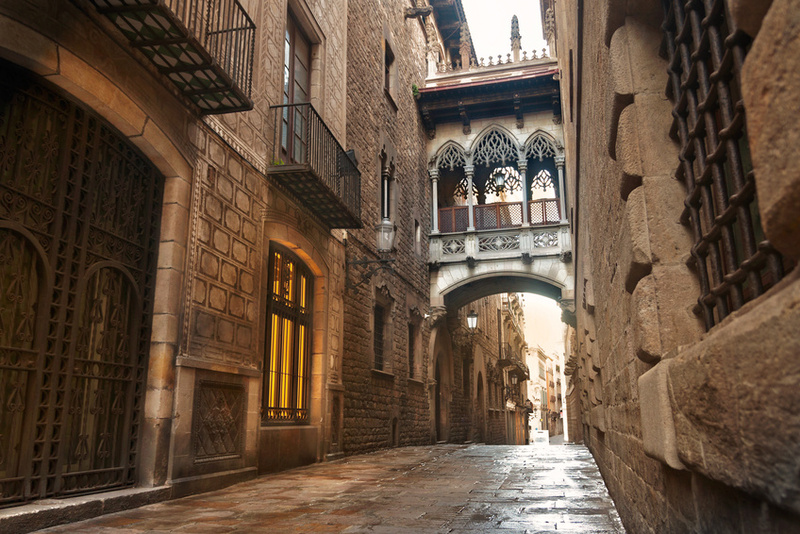 Still, it is highly recommended to wander through its alleyways that transport you to the time, and even if you take a little imagination can relive the story of a Barcelona that not everyone knows, and which has too much to tell. 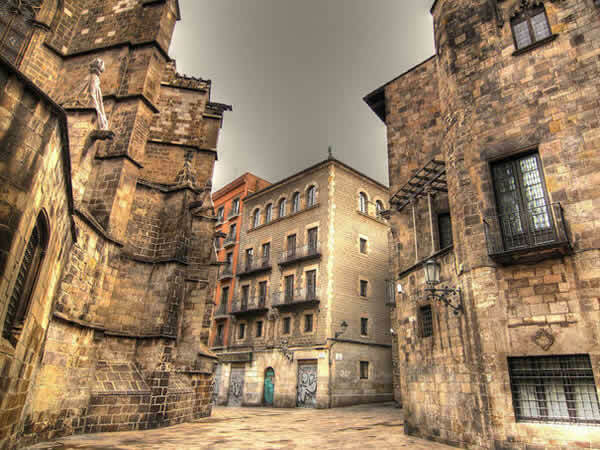 In this Call, you’ll find the Synagogue Mayor of Barcelona, probably the oldest in Europe, and was discovered by chance. 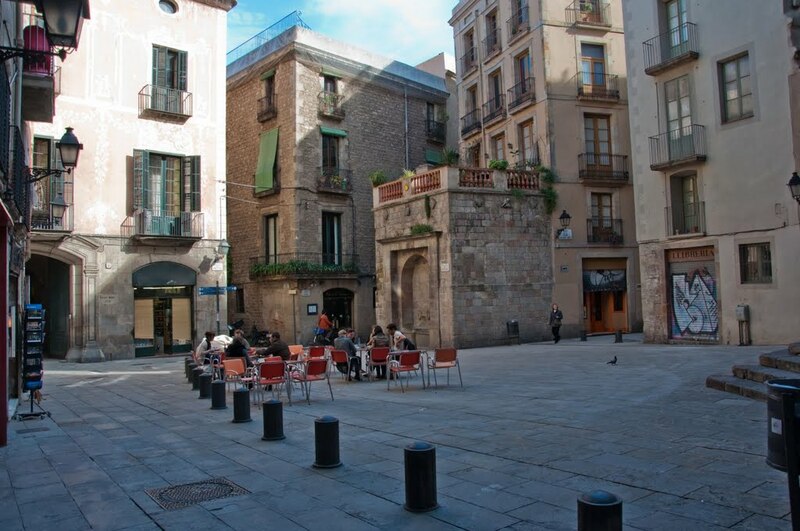 Plaza del Rey: A rectangular space surrounded by important buildings in Renaissance and Gothic style. The most remarkable monument is the Palau Real Major, where they lived the Counts of Barcelona and the Kings of the Crown of Aragon until the fifteenth century. 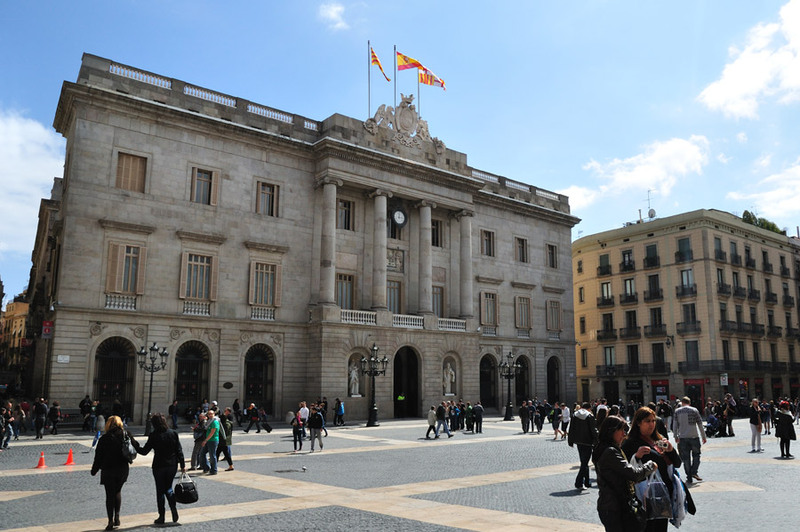 To this building, were added other structures that have also left their mark in the history of Barcelona and they tell us how people lived back: – Salo Tinell: in it were celebrated important ceremonies were held and received large personalities. – Palau Lloctinent and the viewpoint of King Martí (Mirador Del Rey Marti), known for its height, considering it was built in the century XVI. – Mirador Del Rey Marti separated the two previous buildings. And he stands out for its height. A five floors tower that stood out and ran away from the architecture of the House Padellàs period. – : moved stone by stone from Mercaders street because of the construction of Via Laietana. This building was converted in the Museum of history of the city (MUHBA) in 1931, when by chance and through excavations the chapel of St. Agatha was discovered, built on an ancient wall Romana. – Eduardo Chillida sculpture: this was the latest work of the Plaza del Rey. Bridge of Obispo: Located in the street of Bisbe Irurita (Bishop Irutita), sports although much older appearance Gothic Revival architecture. Data from 1928 by Joan Rubió Bellver and serves as a connection between the Palace of the Generalitat – where the current political activity of barcelona- city and the House of the Canons develops, and at first time was as an overpass for people like: Lluís Companys, Francesc Macià and Josep Tarradellas. A curiosity of this bridge is that it has carved from a skull pierced by a dagger skull coming out again in the mouth thereof, and which are already at different rumors and legends inside. Portal De l’Àngel: It is one of the portals which was giving access to the city in medieval times. The first portal opened and the last closed every day. Originally it was called Portal Dels Orbs, but the arrival of the speaker Fra Vincente Ferrer, who told to all the city through one of his sermons the story of a miracle, the vision of a young winged armor and carrying a sword flames proclaimed to be the caretaker of Barcelona and guard it. Today and as in the eighteenth century it was one of the busiest areas of the town. A walk through where intense commercial activity developed and now giving way to one of the best known areas of the city, such as Gracia. Santa María del Pi Church: This temple was built in the fourteenth century, although a Romanesque door of the XIII century. Majestic for its immense dome, one of the largest in the country, and different from others, because it consists of a single ship surrounded by several chapels. Also impressed the buttresses that protect it, and especially secure and above all its windows, through which natural light could penetrate, creating a warm and peaceful environment in the area inside the altar. Bosco: A lovely restaurant like something out of Roman times serving delicious tapas and exquisite range of dishes at very reasonable prices. Bosco serves as an appetizer Potatoes Bosco, which are similar to the typical “Patatas Bravas” and then to eat well, different homemade dishes, such as the cannelloni Bosco: Pularda roast stuffed with mushrooms and foie gras. Can Culleretes: It is a traditional family business, one of the oldest in Spain. In it you will find typical Catalan food at a good price. Ones of the best dishes are: cannelloni brandade of cod, bream baked and escudella and meat of pot. (C. /Quintana 5). Matís Bar: It is a lifetime bar, but with a modern twist, made ​​by the owner, no less than Artur Martinez, a Michelin Star in Terrassa. This chef delights us with his dish, with its own identity which has called “xatorejo”, a mix of xató with gazpacho. (Plaça Nova 5). Raso Terra: in the Gothic you will find all kinds of restaurants, and with this one you can enjoy vegetarian food. MariscCo Plaça Reial: It is the second store opening, after a first success in the Eixample district. Although they do not follow the dynamics of business, they continue working with the same product: fish and seafood, both in the fish exposed to the customer to check that it is fresh and quality raw material, which does not involve an extra boost price, the same for its amazing terrace, which excludes any charge. (Plaza Reial). We know this is a small list, but quiet varied. Not that runs restaurants here offer to satisfy hunger, but if we start could not stop. We prefer that you go walking through the labyrinthine neighborhood and discover the rest by yourself. 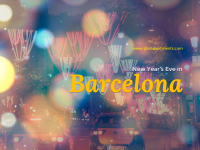 Even we suggest you to go to party one of your nights and get to know the true scene of Barcelona: you can always start by the Plaza Real with good seafood and digest with a Gin tonic, providing for your holiday, and since you are there, you can enjoy a little dance in some of the pubs, located in the same square. 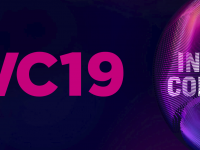 For close all this, we will let you a trick for getting your night out relatively cheaper, so you can sign in one of the lists on Facebook, for free entrance, and which will premise you also to know the type of music, people and their timetables.